“Arts for Health” is growing movements based on the principle that integrating an art practice into the life of individuals, groups, and communities can greatly enrich both mental and physical health, and support personal and community groups. 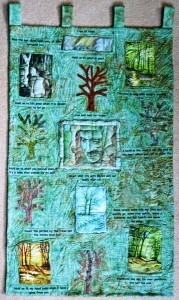 As a textile artist I am particularly interested in how effective working with textiles can be in this field. I have helped as a volunteer in a hospice day centre getting patients to think about how art and textiles can help them overcome their fears of what their future will be. They have been encouraged to make memory boxes and books for those going to be left behind. 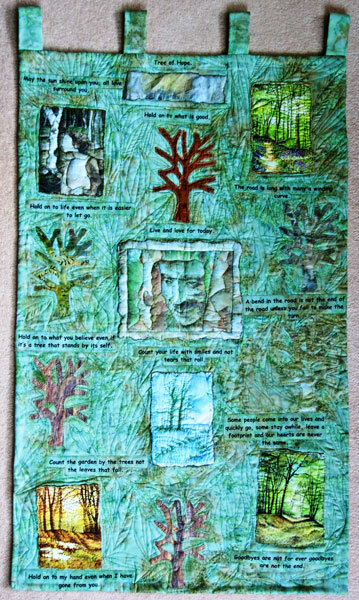 It was the patients suggestion that I work on a hanging based on trees for the relatives room as this overlooks a wood, so to some extent it has been worked how they and the hospice wanted. This has made the prospect of working creatively in textiles less scary to patients, more achievable somehow, than, “ art” for “arts” sake. I am excited by the hook that using textiles creatively has into the very fabric of peoples lives and histories and the opportunity it offers them to spin their dreams when their time with us may be short. We have had wonderful discussions [ and tears] on family histories and what they want to leave behind. The staff now, including cleaners are all working with patients on things creative ,from drawing, photography, textiles, a Sense garden and a mural. Funding from the “Arts for All Project” has been received to carry on with the work that has been started. I am currently working on a project investigating how Creativity can help improve the psychological and healing process aspect of all kinds of illness. This has been designed from my pictures and drawings of the trees in changing seasons to show the wide range of colours. The individual pieces have irregular edges as nothing in life is straight forward and these have been quilted and embroidered. They have been applied to a quilted fabric background of poly cotton, that has been coloured with silk paints to represent trees colours. The quilted leaves are falling in all directions for the turbulence of life. The face is of a tree spirit on a birch tree, from which many cancer medicines are derived and there is a healing tree angel at the top. The words are printed on to fabric and applied to background and are reflection on life and death, both for hope and comfort. I enjoyed working this and hope it will bring pleasure to those who view it.